Kondalilla Falls is a beautiful waterfall located within the Kondalilla National Park which can be reached via the scenic Blackall Range. The falls themselves consist of a 90m waterfall where the Skene Creek drops to the rainforest valley below. The name “Kondalilla” is an Aboriginal word meaning ‘rushing waters’ and describes this park’s waterfall during the summer wet season. Above the falls, you will see a dense eucalypt forest which joins with a beautiful rainforest. Here, you will find over 100 bird species, 70 species of reptiles and 30 species of frogs. At the base of the falls, you will find a swimming hole where you can cool off for a swim on a hot day. There two main walking tracks around the falls including: Picnic Creek circuit – A 1.7 km, 45 minute easy walk across Picnic Creek where you can enjoy views over the valley from a lookout point; and Kondalilla Falls circuit – a 4.7 km, 2-3 hour walk where you will come to the waterfall, walk down to the base and continue back up the ridge. There are over 100 stairs on this track, so walkers will need to be moderately fit. 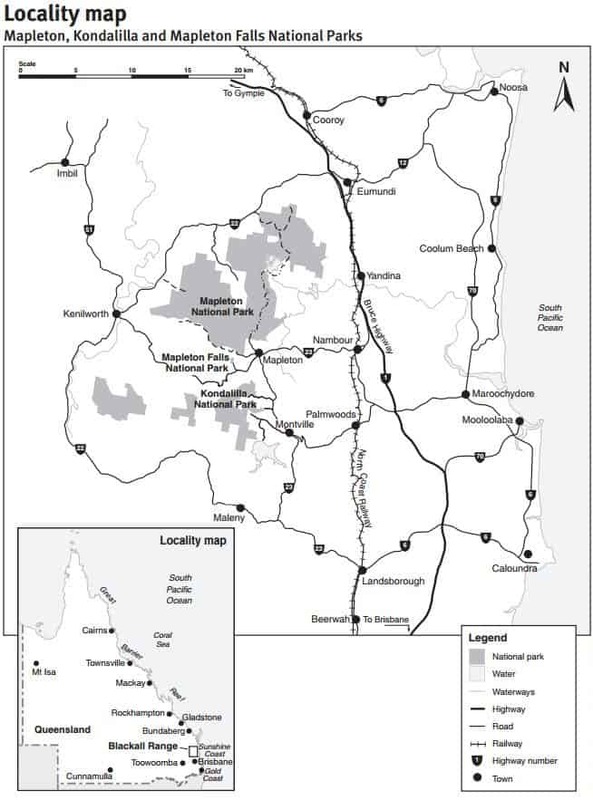 Camping within the park is only permitted at the Flaxton walker’s camp which is a bush camp for walkers who are completing the 58km Sunshine Coast Hinterland Great Walk. Vehicular access to this campsite is not available. 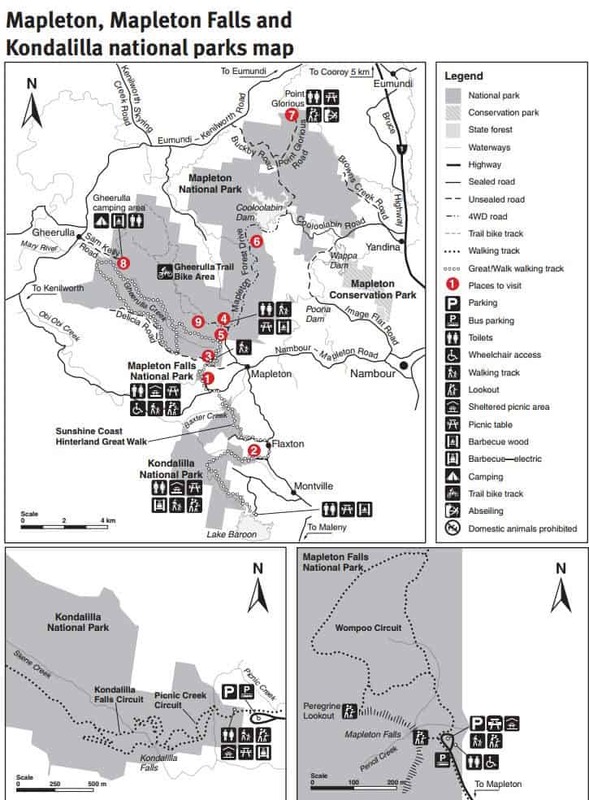 Vehicle accessible camping areas are located in the nearby Conondale National Park, Imbil State Forest and Mapleton National Park. There are picnic facilities located just 50m from the carpark which includes a large grassy area with picnic tables, BBQ’s, toilets and shelter. Please note that there are no wheelchair-accessible tracks or facilities in Kondalilla National Park due to steep terrain.